Explore and immerse yourself in the beauty and splendor of this historic settlement along the Kenai River! 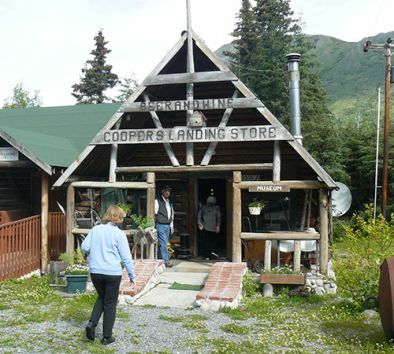 Surrounded by the Chugach Mountains, this tour takes you to stunning lookout spots, a friendly log cabin homestead with long-time local ‘Larry’ to share stories of the past, the local museum and gives you a chance to meet dog musher Lorraine’s sled dogs and to take great photos of the huskies! Enjoy a gold panning demo complete with authentic canvas wall tent camp! Learn how the Dena’ina Indian natives lived and thrived and visit an actual home site used over 200 years ago! The final stop, the local cemetery which promises to intrigue you as none other you have seen! Hear stories of the pioneers as you keep a watchful eye fur for wildlife along the way. Your guide is an expert on the history of the area and combines this with more than 20 hears as a dog musher, boat captain and over 30 years living the Alaska lifestyle! You travel in a clean, 13 passenger van for the best intimate experience. Receive the most unique souvenir to remember your adventurous day in Cooper Landing! Wear comfortable walking shoes. Bring a jacket, hat, gloves and a camera. Wildlife sightings are likely but not guaranteed.